Home » california , constitution , government , law enforcement abuse , lrad , military , patriot act , san diego , weapons » Why are local law enforcment agencies deploying high-tech sonic weapons against citizens? Why are local law enforcment agencies deploying high-tech sonic weapons against citizens? Call it what you may, a law of either history or human nature. Anything can be used as a weapon... and that a thing intended as a weapon will be used as a weapon. Concordantly, there is no reason to produce a weapon unless there is a determined possibility of using that weapon. The San Diego Sheriff's Department is now in possession of a Long Range Acoustical Device or LRAD: a "sonic weapon" straight out of science-fiction (particularly Atlas Shrugged). This is something that has been used in Iraq against insurgents and also recently against pirates off the coast of Somalia. Quite effectively, it should be noted. Well, now San Diego County Sheriff Bill Gore has been placing his new toy at town hall meetings where citizens have been coming in droves to protest "health care reform" and bigger government. 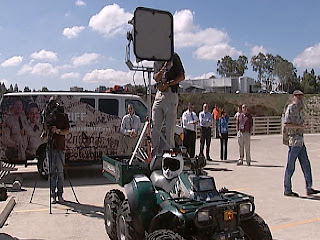 A spokesman for the San Diego Sheriff's Department claims that the LRAD will not be used as a weapon by the department, further alleging that the LRAD is only going to be used in emergency situations like warning residents during fires or floods. However, Sheriff Gore has previously acknowledged that the LRAD could be used for crowd control similar to pepper spray. What's wrong with using a bullhorn, or a truck-mounted stereo system and microphone? What is wrong with using pepper spray? There's not the potential for life-long injury (especially to children and unborn babies) with those measures as is the case with the LRAD. I'm gonna say it if nobody else will: there are many agencies of the government, and San Diego Sheriff's Department is lookin' like one of 'em, that are no longer accountable to the people. To aim something obviously intended for military purposes at regular American citizens goes way beyond a simple "chilling effect" and too far into the realm of being nothing short of a full-blown scare tactic. Let me be even more succinct: if a government boasts of having a weapon against its people, it will inevitably use that weapon against its people.